Many people enjoy the luxury of owning a boat, but nothing compares to a yacht like these docked in the Digue de L'Avant Port along the Cote d'Azur in Monte Carlo, Monaco in France. 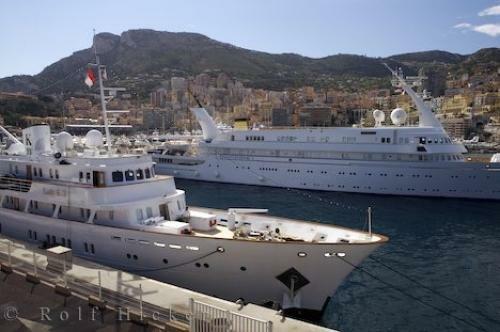 Most people only dream of being aboard a yacht like either one of these that dock along the Cote d'Azur near Monte Carlo, Monaco in France. This may be as close as you may ever get to these magnificent homes that cruise around the world by water. A boat like this is very common along the Cote d'Azur in France especially during the summer months as many of the rich and famous travel here to throw away extra cash in the elegance of Monte Carlo, France. Yachts the size of these are very comfortable to spend months aboard and travel the open waters as every amenity you can think of is on board. A yacht such as this has more than the average person has in their home but the people that own these boats use these cruisers as toys for their pleasure use. Photo of the luxurious style that can be enjoyed on a yacht while touring by boat along the Cote d'Azur in France, Europe. Pictures from photo gallery "Monte Carlo Pictures"
This picture is part of the photo album "Monte Carlo Pictures" - there are more beautiful images waiting for you. ... dining room, bathrooms the size of a bedroom, top of the line staterooms, a jacuzzi on the sun deck along with a pool, casino and various other rooms to relax in along with a crew that is at your beck and call. Each yacht that pulls into Digue de L'Avant Port on the Cote d'Azur in Provence, France is fascinating to look at while strolling along the waterfront of Monte Carlo. It is hard to believe that some people can actually afford to run a yacht like these, but when you look around the harbour you will be amazed at how many and how big some of the privately owned yachts are. Monaco, France has a yearly yacht show which brings out thousands of boat owners to either show off their treasures, search for a bigger and better boat or to get together with old friends that cruise the waters along the Cote d'Azur.